The Artist and Alienation in "Drowne's Wooden Image"
Drowne, a woodcarver who has established a reputation for producing adequate but not inspired figures, accepts a commission from Captain Hunnewell to carve a specific figurehead for Hunnewell's ship the Cynosure. As he works upon the carving, Drowne becomes more engaged with his artistry and more aware of the potential to convey the energy and dynamism of the human form in sculpture. Like Pygmalion, whose myth inspires this tale, Drowne falls in love with his creation and wishes it were real. 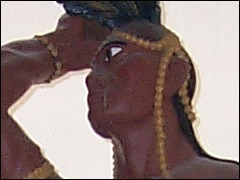 Hawthorne reveals that a living version of this figure does exist when she appears in the company of Captain Hunnewell. The carved figure of the mysterious lady is Drowne's one great success; afterward he returns to being "the mechanical carver in wood, without the power even of appreciating the work that his own hands had wrought." Within this retelling of the Pygmalion myth, Hawthorne embeds a number of issues that relate to the experience of the artist within his community and with his art. The painter John Singleton Copley, famous for his portraits of distinguished Colonial New Englanders, appears in the story. Like Drowne, Copley was primarily self-trained, yet saw himself as an artist, not a craftsman. Hawthorne uses dialogues between these two men to explore the lack of community for artists in America, the ways in which an artist is viewed by his or her local community, and the ways an artist thinks about his or her work and the nature of art. Critics and biographers, such as Claudia Durst Johnson and James Mellow, have commented on Hawthorne's sensitivity to the place of an artist within American culture that shapes some aspects of this tale. In his prefaces, Hawthorne commented on the lack of appropriate material in America for the writer of Romance. In this tale, the inspiration for the artist Drowne resides in the foreign and exotic aspects of the woman from Portugal. Other critics, including Millicent Bell read the story as one of Hawthorne's explorations of the Romantic ideal of creativity, while Michael Wutz suggests that the story also encompasses another of Hawthorne's explorations of the concept of the fortunate fall.